Who says big things can't come in small packages. 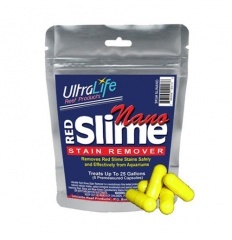 Introducing NANO sized Ultralife Red Slime Remover. Ultralife has been one of the most popular treatments for Red Slime. Now they have come out with a Nano that lets you precision dose smaller tanks. Ultralife Red Slime Stain Remover is a revolutionary time tested product. Ultralife RSSR contains natural cellular matter, select biological accelerators and special supplements proven effective in cleaning Red, Black and Blue-Green Cyanobacteria Stains from aquariums. Continuation of protein skimming is recommended but may require adjustment. Due to the increased biological digestion of organic solids, we recommend increasing your 02 levels by the addition of airstones prior to and during product usage. There is no need for water changes or removal of carbon filtration.